One of the many things that makes me very happy as a designer is seeing different interpretations of a sweater I’ve created. I often learn a lot from the modifications knitters make to my patterns, and sometimes a simple change of shade can make a design look like a completely different garment. 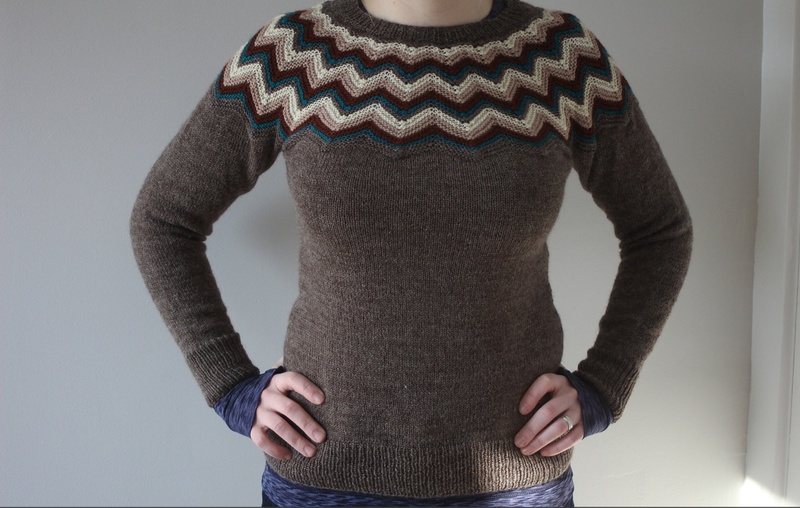 The Puffin sweater is one of my favourite patterns in Colours of Shetland, and it was designed with a very specific palette in mind: the puffin-y palette, which you can see above in Rebecca’s lovely sweater. But many knitters, through subtle or dramatic alterations in the design’s original shades, have created some wonderfully different Puffins. Here, with their permission, are a few examples I’d like to show you. Here’s Barbara in her Puffin, together with Bramble (who, like Barbara, enjoys visiting Shetland). At a first glance, Barbara’s sweater looks pretty much like my original, but she has actually swapped the garment’s main colour – Jamieson & Smith Jumper Weight shade 77 – for shade 81, which is a much quieter, softer black. I confess that shade 77 can be a real bear to knit with, as well as to photograph, and I love the slightly muted effect that shade 81 has lent to Barbara’s Puffin. 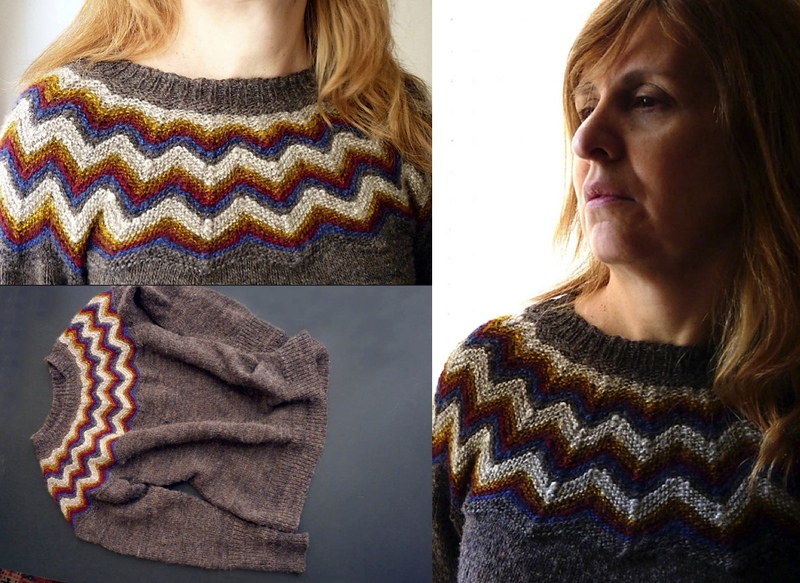 When designing the Puffin sweater, I spent an awful lot of time swatching to create the correct colour sequence for my chevrons, and was interested to hear that Rhiannon and Valerie did the same when making theirs . . .
Rhiannon began by swatching a dark-to-light gradient across the yoke, but when that didn’t work out, came up with a chevron sequence of several graded and contrasting monochrome shades, using Jumper Weight shade 27 for the main colour. Valerie is very fond of the undyed, sheepy shades of Jamieson and Smith Shetland Supreme. She settled on Shetland Black (shade 2005) for her main colour, with 7 different shades worked through the yoke. The way these these natural shades effortlessly speak to each other means that the effect is both simple and striking. I think Valerie’s and Rhiannon’s natural Shetland sweaters are absolutely stunning. After rejecting the 1970s palette, Erin settled on this lovely combination of tan and teal in the yoke, both of which really pop out against the subtle stone shade she used to knit the body. 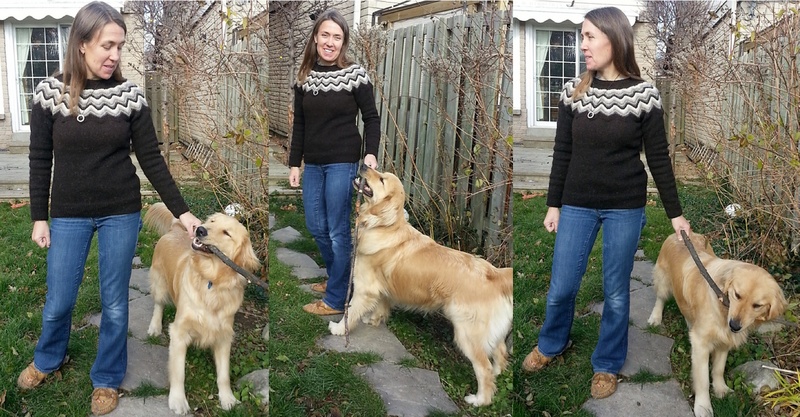 Deb’s “parrotty puffin” is one of my favourite iterations of this sweater – it is just so striking! 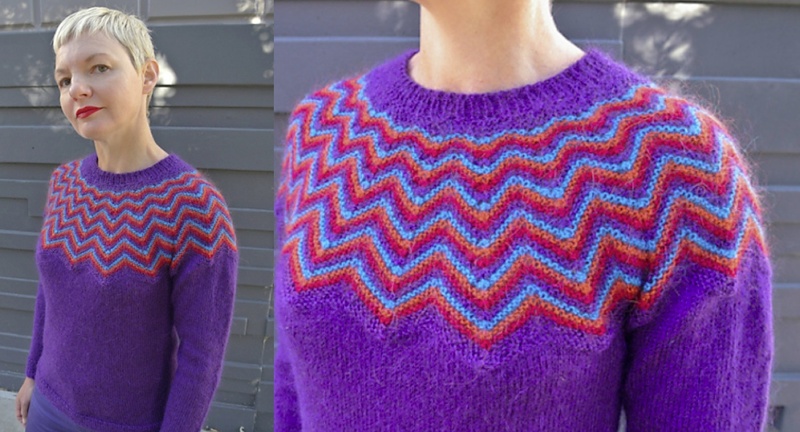 As well as the bright lorikeet palette, I really like the way that Deb’s more closely-placed colour changes through the yoke lend the garter-stitch chevrons an incredibly graphic, luminous effect. 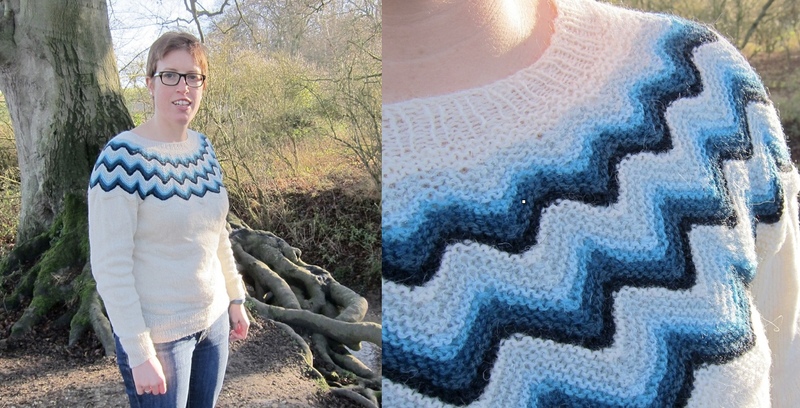 Kate found the chevron yoke to be reminiscent of waves, and chose the graduated blues of the yoke “to evoke the Shetland and Suffolk coastlines,” and to contrast with her favourite winter white (Kate has blogged about her sweater here). Maureen, meanwhile, loves to fill her wardrobe with colour, and was keen to knit herself a sweater to match the wonderful kilt she’d recently treated herself to from Scottesque. She devised a pretty pastel palette, which is perfectly complemented by the corrugated rib at the hem and cuffs. Both Maureen and Kate used slightly thinner Shetland yarns when knitting, and their sweaters have a lovely light and feminine feel. 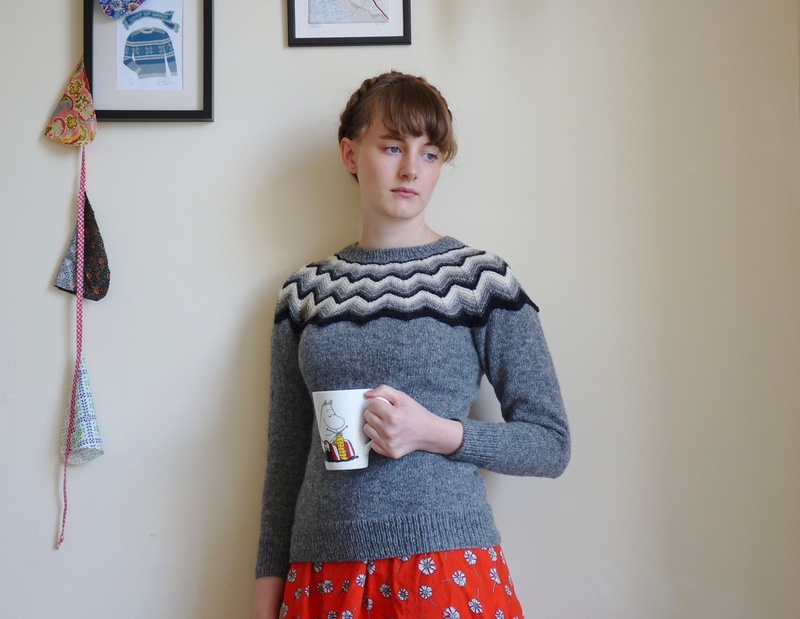 Zaz’s hand-spun puffin sweater is truly a labour of love, and is the garment that prompted me to write this post. 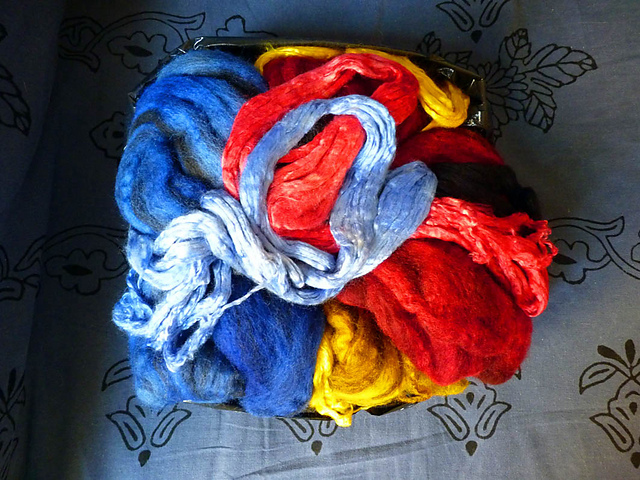 Zaz won a prize in the 2012 Tour de Fleece, and requested this beautiful custom-dyed BFL and silk fibre from Mandacrafts. This is the yarn that she created. . . I entirely agree with Zaz, and love the way that she has spun and knitted her own story and distinctive sense of place into her sweater. But I have to conclude this puffin post with a photograph of Mary’s “puffling”, which she knitted for her grandaughter, Robyn, who loves all things red and Robin coloured. 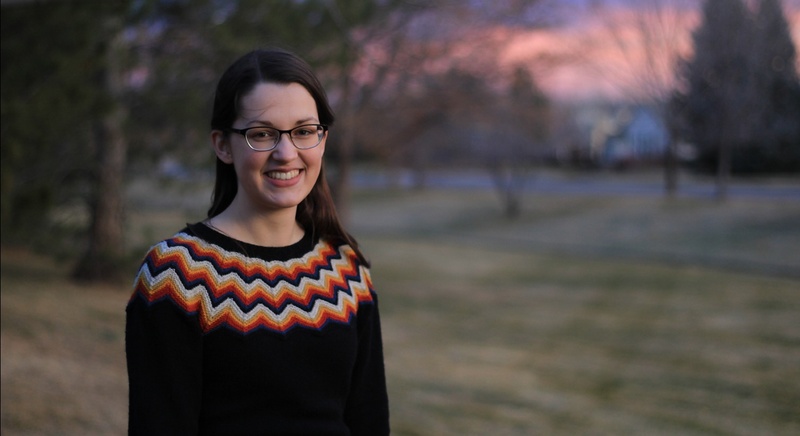 Mary knitted the puffling from assorted stash yarn, working a basic yoked cardigan, and adapting the puffin chevron yoke to be worked back and forth in a smaller size. 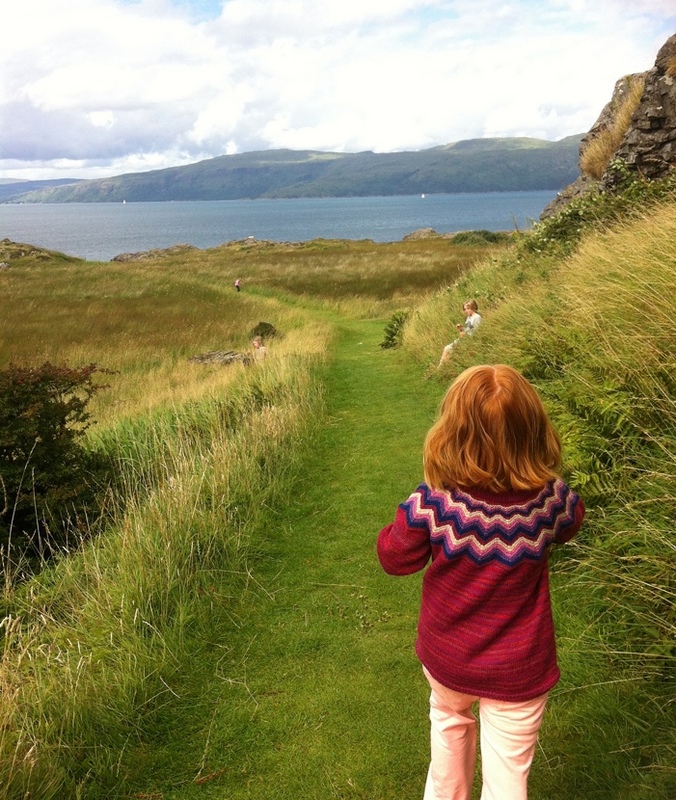 Mary’s photograph of her lovely wee girl, in her puffling cardigan, in this gorgeous landscape, just makes my heart sing. Thankyou, Puffin knitters, for all this inspiration! 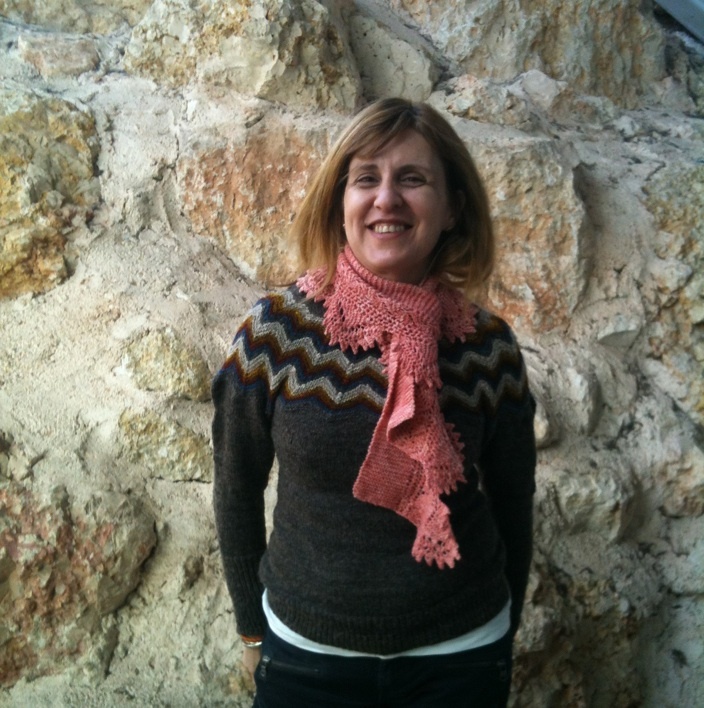 I am a HUGE fan of yours, (I stalk you on line, but in a good way…)I just finished knitting your Scatness tam, and I loved knitting it so much I am going to knit 2 more, I knit a cashmere and silk lining, on mine very cush! Keep up the wonderful designs. So your designs are being seen around Ottawa Canada eh! Such beautiful variations! I love each and every one and may perhaps be planning a second Puffin already. Zaz’s is stunning! I know you’re interested in fishwives, Kate, so I wondered if you’d seen this art/theatre project? I love puffins, possibly originally because I was a big reader as a child and wanted books above all, but later for the birds themselves. I love your sweater (though I have not – yet – knit it) and have had it noted for a while, now. Such loveliness in all these knitted interpretations. Where, oh where, is that little puffling going? I must know so I can walk that path one day! I love how these photos reflect each one’s personality. I am knitting Scatness tunic at the moment. rainbow lorikeets visit my balcony too – I live near the Dandenong Ranges National Park. 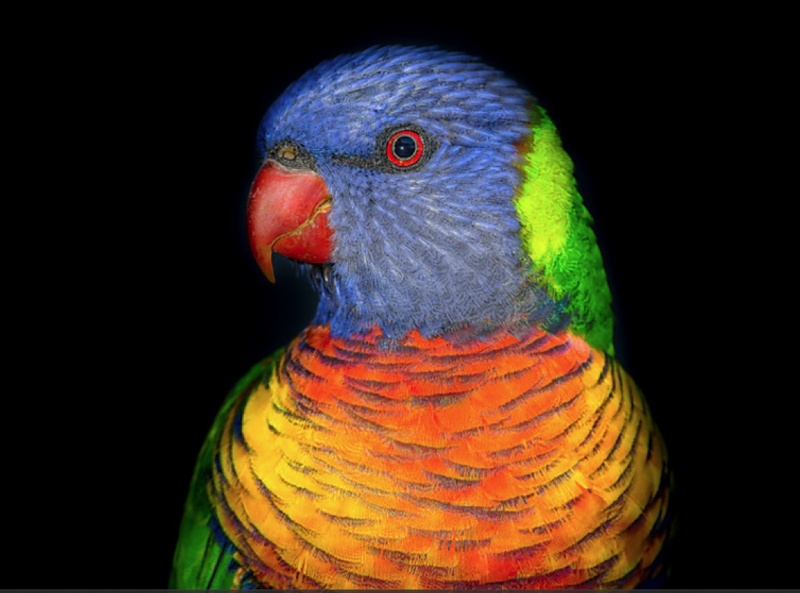 Lorikeets are the bully boys of the bird world – tiny, they are so overmuscled that their wings stick out a bit. They march up to the other birds – rosellas, king parrots, and even sometimes sulphur-crested cockatoos – and inform them that they are eating now, thankyouverymuch! Such a wonderful post…thank you! They’re all fabulous. My favourites are Zaz’s and Deb’s bright one! Hi Kate, your Puffin post reminded me that I meant to let you see my hand-spun and hand-dyed Scatness tunic, which has hardly been off my back since I finished it late last year! I have to say Zaz was my absolute favourite!! I’ve just started spinning and suddenly realise how long it takes to spin enough yarn for a jumper! And the shiny colours are beautiful! Love this post and puffins very much. Such a lovely blog post, very very inspirational, thank you! Terrific! It’s SO COOL to see peoples’ creative processes. Rhiannon, I love your sweater – but I also LOVE your moomin mug with Moominmamma knitting! 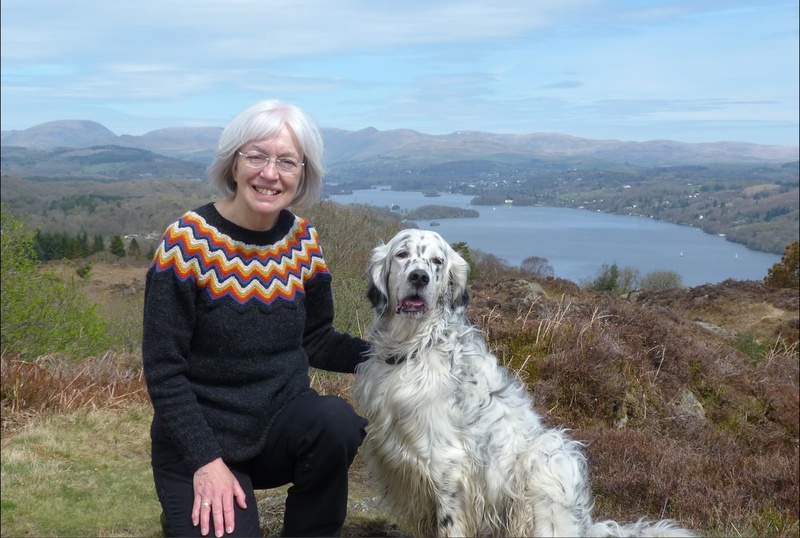 Fantastic to see the Puffin sweater in all the different colour combinations – I particularly like Maureen’s. I’ve got the yarn to knit my own and it’s in my ‘to do’ knitting pile. I’ve chosen blue instead of black and slightly brighter colours for the yoke. I hope it turns out as great as the other knitters! 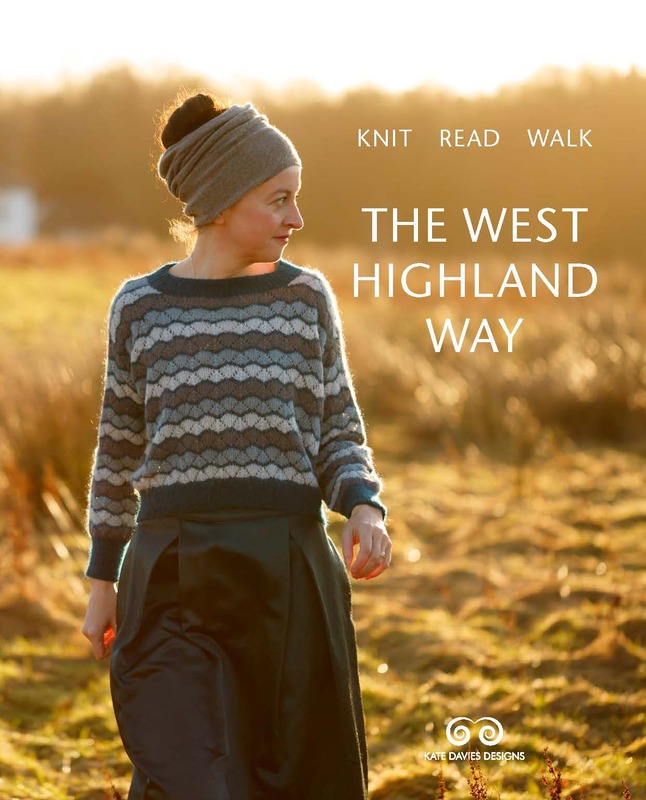 I love these sort of posts – absolutely fascinating to read about how the creative process continues once the pattern’s in the hands of the knitters. 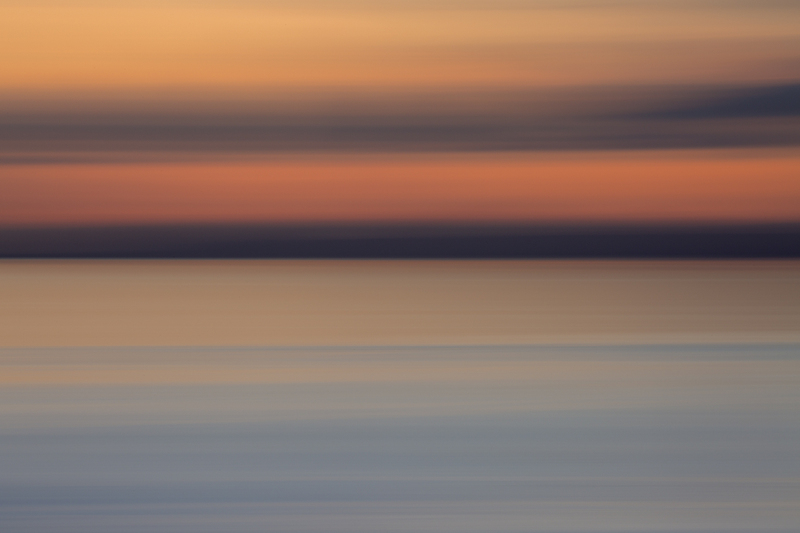 Oh, and thanks for the link to Scottesque – beautiful and now bookmarked! What a lovely post. I’ve been looking at the various incarnations of ‘Puffin’ since the book was released and once I’ve finished my current pair of socks I’ll be doing a tension swatch (ok, maybe a bit before I finish the socks!!). I love all of these. 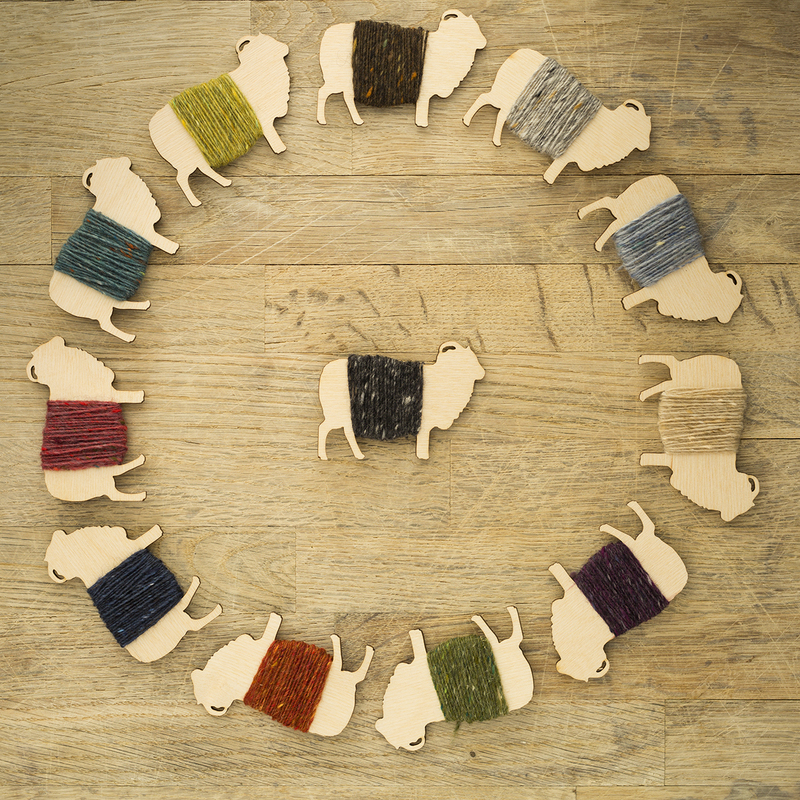 Thank you (and the knitters) for sharing them with us! So much thought, care, and time went into each of these renditions. Wonderful creations all! The puffling gets my vote for the best version!! Beautiful sweaters and images. 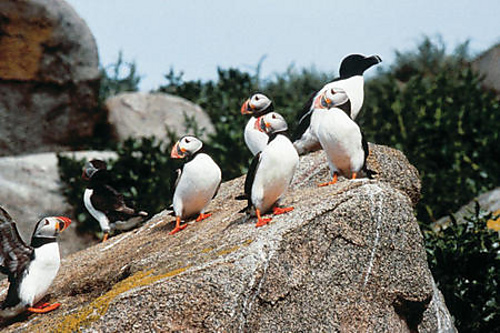 Thanks for bringing them to our attention, and thanks for designing The Puffin that started them all. These are all so lovely….like wearing a little shawlette over their sweater. Oooo they are all so lovely, I am sorely tempted. Do I spot Duart castle with that wonderful Puffling? Can’t wait to be back on Mull in April! They are all beautiful… and inspiring! 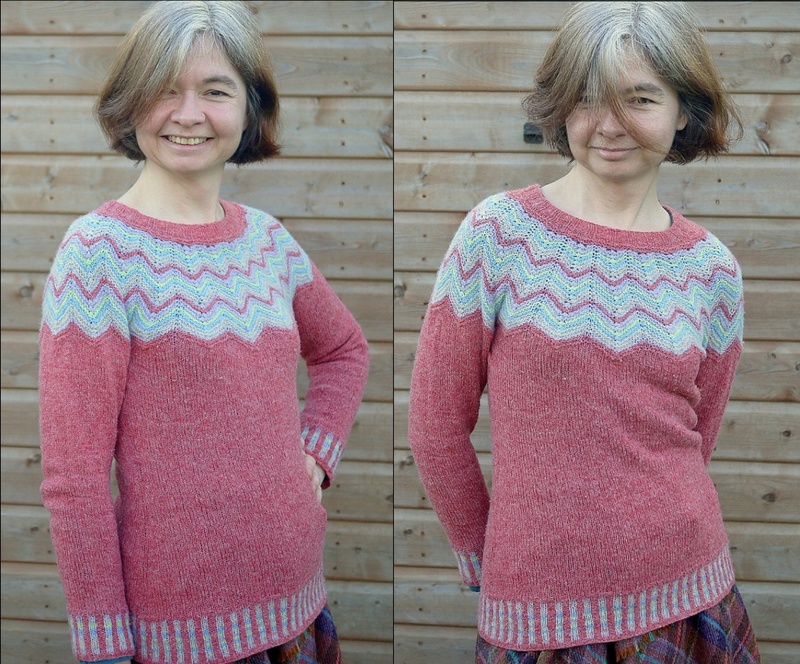 Puffins is one of my favorite sweaters in Colours of Shetland: thank you so much for sharing these gorgeous versions! Oh wow, and wow! These are all so beautiful. Such an inspiring collection – raft – of puffins!! Fabulous ladies! this has rekindled my desire to knit a puffin for myself. it is my favorite from Colours of Shetland. this is looking to be a year of sweater knitting for me. I love, love, love all the different color combinations! How pretty all the color combinations are. I’m glad to hear, Kate, that you don’t mind when we change the original colors of your designs. I wonder sometimes if designers might not be insulted if people don’t follow the design to the letter. All so different but each one is stunning. What a creative lot we knitters are. Great post – I read every word! 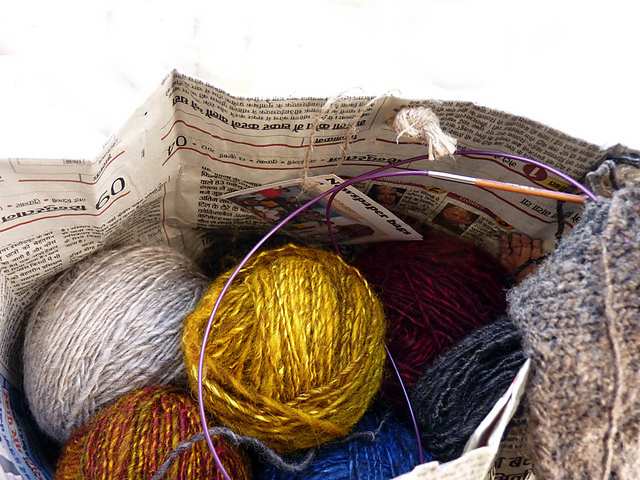 Thanks to everyone for sharing their knitting and design adventures. How infinite the variety. All lovely! It must be so lovely to see your designs come to life in so many different ways. I’ve seen it myself as my sister knit 5 versions of your owl sweater; 1 for each of 3 daughters and 2 for herself (first was felted by the husband and made into a handbag)! These are all fabulous! I have no vision for color so especially love to look at so many variations. Love the beginner (?!?) spinner’s sweater. I finished my puffin last spring, days before I was leaving the USA for 2 months in Australia. My daughter said I should take the Puffin since it would be winter there, but I just held it up and said “But what if they loose our luggage?” And they did. But then we came fall back home and here is this horrid and endless winter , and I wear that sweater constantly. The fit is glorious, the colors amazing, and like other who have been to Shetland and seen the puffins flying, it also has meaning. I love the variations here, but for me, the original is the best. Now that cheered me up this AM……-21C this AM!! I am terrible figuring out colour combinations on my own and these women rocked it! Thanks. I’ve been checking Ravelry regularly for other variations, it’s a beautiful sweater but the colours – although they are beautiful – are so unlike me. Thank you Kate for sharing this inspiration. Can I have one of each, please, what gorgeous interpretations of your wonderful design. I’m knitting my own puffin sweater at the moment. I’ve chosen to go with Kate’s original colours, but I love seeing what people have done and am already thinking about a cream and brown version. They are all wonderful. I wish I was up to knitting one. Sadly my fingers can’t manage big projects nowadays.